Our laboratory is part of the Section on Integrative Physiology and Metabolism at the Joslin Diabetes Center. We focus on the mechanisms underlying the regulation of the energy balance to develop potential therapies for combating obesity and related diseases. “One reason why some people tend to gain weight more than others is because their bodies aren’t as efficient at converting sugars and fat into energy. The discovery of a set of genes controlling this process could lead to new treatments for obesity and diabetes. 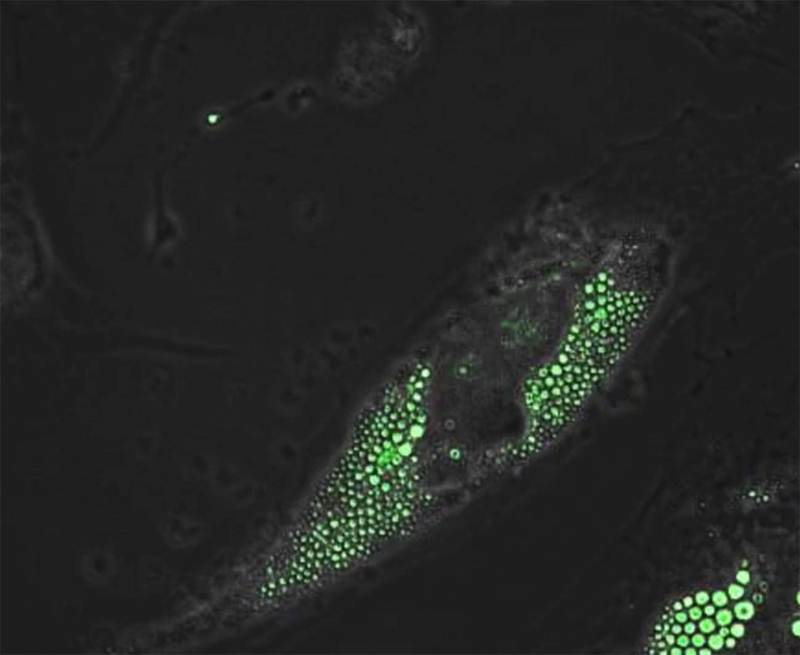 We all have ‘good’ brown fat cells that produce a calorie-burning type of protein called UCP1 – seen as the green-stained dots in this picture of a progenitor brown fat cell. Researchers identified genes that can boost or slow down UCP1 production, a bit like a dimmer switch on a light. In future, controlling these genes may allow doctors to increase the activity of brown fat cells, so that they remove sugars from the blood more rapidly or burn more energy stored by ‘bad’ fat cells, making them shrink.” -Mick Warwicker, communications consultant, science broadcast journalist, and writer.